Was it Mario or Luigi news? Whatever it takes he loves being here and firmly believe he wants to be a part of Wednesday winning promotion to the premier and he will play a massive part in achieving this bonkers of we don't do all we can to keep him! How dare you diss the MEGATHREAD! Have a strong coffee and come back later at 5PM! If he loves old players half of Swansea team out of contract! What's the likely scenario regarding JR? I really wanted to see him and Winnall as a front 2 add some pace on the wings and another Keiran Lee type player just a bit stronger on the ball in midfield. I thought at one bit João looked to have raw pace or is this just me? Trying to think outside the box if money is an issue so perhaps based on this Rhodes should go? Looks like he could be on hefty wages. Please move to the FAKE section of the page. Who's going? Who's staying? Who's coming in? Realistic signings? (If any due to FFP) Any out of contract possibilities? Is our current squad based on what we've seen since Brice's arrival really that bad? Is it possible due to FFP that this squad with a few shrewd deals can compete for autos? Providing we don't lose key players like Westwood to Huddersfield that man alone is worth his weight in gold. It's going to be tough especially if we are hit with a straight points deduction! Bruce has a speciality in this league. Look at the best teams in this league this season when we've been at out best we've more than matched them in footballing ability IMO just can't help feeling if we'd have had Bruce from the off we'd have been up there with Leeds United and Sheffield United. Of course it's still mathematically possible with results going our way but let's be realistic and focus on the summer signings if any and how we go about the 2019/20 season. Brilliant end to the season Wednesday!! Derby Bristol DRAW Middlesbrough LOSE to Reading Wednesday BEAT Preston Millwall BEAT Bristol Swansea BEAT Derby It's down to last game of season? Hmmmmmm done rather well under Bruce me thinks. Compared to Dros it's bloody marvelous! Stoke Norwich Derby Failed to beat us? We beat Villa away? 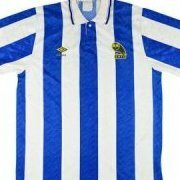 Drew with Leeds at home? Not done too bad this season with the best in form teams of the season have we? Well he didn't Uncle Steve.